Developer of the innovative Displacement Glider (DG) hull which offers: increased range due to 30 percent lower fuel consumption to similar sized displacement boats, twice the speed of a displacement boat with similar engine power (in tests, around 19 knots with 288 kW engine), and due to the unique keel it can offer up to 20 percent more space than similar displacement boat. Vienna. Web Site Snapshot: If available, above is a snapshot of the Alsphere web site at http://www.alsphere.at/ as it appeared when this site was added to the directory or last verified. 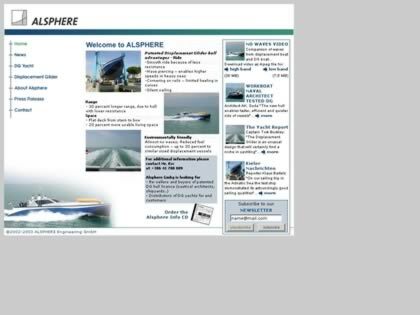 Please Note that Boat Design Net has no involvement with the above web site; all content and images depicted in the above thumbnail are the property and copyright of Alsphere unless otherwise noted on that site. Description: Developer of the innovative Displacement Glider (DG) hull which offers: increased range due to 30 percent lower fuel consumption to similar sized displacement boats, twice the speed of a displacement boat with similar engine power (in tests, around 19 knots with 288 kW engine), and due to the unique keel it can offer up to 20 percent more space than similar displacement boat. Vienna.